Each fall, with the change in temperature, hundreds of boats complete long offshore passages to get to warmer climates for the Caribbean season. The ARC Rally, crossing from Europe since 1986, used to be the only game in town. This is no longer true, as recently announced trans-Atlantic rallies by Jimmy Cornell, Stokey Woodhall and Sailing Rallies Ltd. have added alternatives. Even the World Cruising Club has added the ARC+ for the overflow from their wildly popular ARC Rally. What is a Rally? Voyaging in a group offers a protective cover similar to caravans of old where groups of merchants and pilgrims journeyed together, usually for mutual protection, in deserts and other hostile environments. Modern day yacht caravans are not linked physically by tethers and nose rings, but rather electronically via sat phones, spot trackers and modems. Rally organizers choose the optimum season and safest routes for their fleet, setting a departure date that spurs the timely whittling of each participating boat’s “to-do” list. They can often help tame the vagaries and bureaucratic red tape and lobby local merchants and tourist boards to roll out the welcome mat. The auspices of the rally ignite and foster camaraderie, and that is the real reason to join a rally. In the United States, sailors heading south in the fall have three options to join a rally, all departing the same weekend in 2013. The 14th NARC Rally (North American Rally to the Caribbean) departs Newport, RI on November 3, with boats ready to depart as early as November 1 if the weather dictates an early departure. The NARC Rally is geared more towards larger boats and professional and experienced crews making the annual migration south, although experienced crews and repeat NARCers are welcome if they have a boat that can make it to Bermuda in less than five days. The third running of the Salty Dawg Rally departs November 4 from Hampton Roads, VA and sets sail for the Bitter End Resort on Virgin Gorda in the BVIs. The Salty Dawg was started by veteran cruisers Linda and Bill Knowles as a free alternative to the Caribbean 1500. The Caribbean 1500, which was bought by the World Cruising Club three years ago, also departs the same weekend, but gathers up the river in Portsmouth, VA. 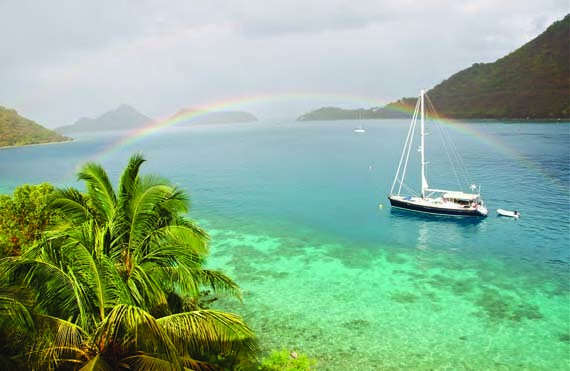 The Caribbean 1500 also goes to the BVI, with a closing party in Nanny Cay Marina. From Europe, the ARC+ departs November 10 and sails to the Cape Verdes before finishing in St. Lucia with the other ARC fleet. Jimmy Cornell’s Atlantic Odyssey has two departure dates from Lanzarote. The first departs November 17 bound for Martinique, and the second on January 12, 2014 bound for Grenada. The Christmas Rally is next departing December 16, 2013 from Lanzarote, sailing for Jolly Harbor, Antigua. The Christmas Rally is designed for families and those having more time in December, combined with a regular holiday schedule, to make the three weeks passage. In 2014, the SWAC Rally (Stokey Woodhall’s Atlantic Circuit) departs in October from the Portuguese archipelago of Madeira and sails to Cape Verde and finishes in Barbados. Stokey also plans a Caribbean Rally. For the 10th anniversary of the NARC Rally, organizer Hank Schmitt made the rally free, with no entry fee. Two years ago it became 100% free with no per-head fee. NARC Rally participants get discounted or free dockage at all three ports, a shared weather router, socials and tracking with spot trackers. The Salty Dawg Rally follows a similar free rally concept. This “American Model” has cut participation in the British-owned Caribbean 1500 Rally that needs to support a paid staff. The free rallies also expect owners/captains to have their boats prepared and safety equipped for a 10-day passage at sea in the fall. The Caribbean 1500 requires a detailed list of safety equipment that would be found on a boat making a circumnavigation. Sailing south in the fall is not to be taken lightly, and all boats should have at least one veteran offshore sailor aboard. Offshore Passage Opportunities (OPO) is the official crew network for both the NARC Rally and the Salty Dawg Rally. Caribbean 1500 participants are also welcome to use this free crew network service. OPO members volunteer to sail for free and pay their own way to and from the boat. This is a free service to all rally participants and delivery skippers and captains needing crew. Sailors ready to try their skills offshore, but need firm dates and a confirmed berth, can “pay-to-play” and sign aboard a Swan in the NARC fleet. With weather delays built in, you will need almost three weeks to complete both legs, and ten days if sailing only one leg. Anyone planning to sail offshore in the future should make a passage with someone else first. Jimmy Cornell’s Atlantic Odyssey best resembles the Corinthian spirit that he evoked when he started the ARC in 1986. The entry fee is only 500 British pounds for any size boat, and only 250 pounds for repeat participants. Both the NARC Rally and the Salty Dawg are free rallies with organizers either subsidizing the rally or organized as a not-for-profit like the Salty Dawg Rally. The NARC Rally started in 2000 with ten Swans in a charter fleet sailing south and invited others skippers to join them. The NARC Rally stops in Bermuda, while the Salty Dawg and Caribbean 1500 do not. With the proliferation of trans-Atlantic rallies from Europe and three around-the-world rallies in play (World Cruising Club, Blue Planet Odyssey and a second Oyster Rally exclusively for owners of Oyster yachts), we can only wonder when an “American model” rally will announce a less expensive Around the World Rally. At present, none of the Around the World Rallies has a stopover in the US.